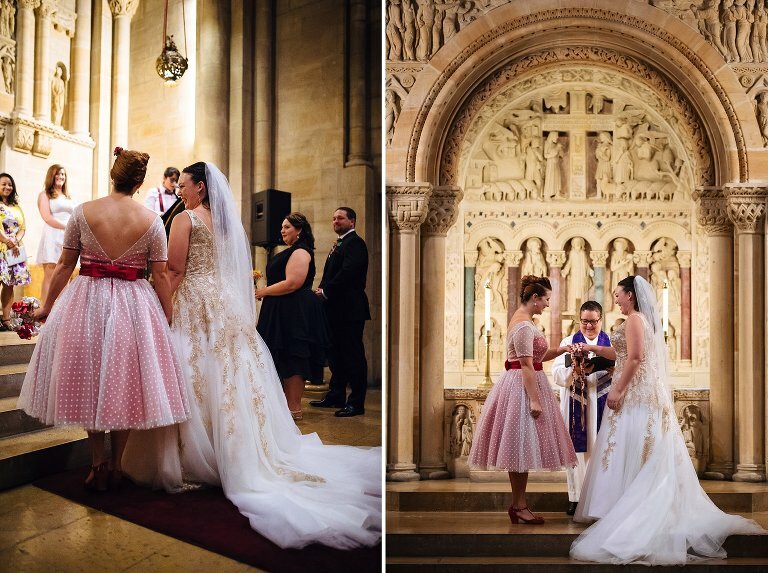 I’m so excited to share these Riverside Church wedding photos from Sara & Deanna’s elopement. This laid back intimate wedding day had a lot of great components, from a stunning church ceremony to a bbq brunch to a Lord of the Rings themed dance party! I love it when couples really take their day and make it their own. Sara & Deanna are huge fans of Harry Potter and Lord of the Rings, so they had a lot of fun details included in their day. But on top of that, they really focused on creating an amazingly fun atmosphere for themselves and their guests to have an all day party. When that’s your priority, it’s hard to go wrong! This church on the Upper West Side is one of the city’s most grand neo-gothic cathedrals, and is an absolutely stunning place to have a wedding ceremony. Sara & Deanna were actually married in the church’s secondary chapel, which is amazing in its own right and was a perfect size for their more intimate crowd. In addition to exchanging rings and vows, Sara & Deanna also performed an Irish hand-fasting. As guests made their way to brunch, I stayed back with the wedding couple for some portraits using the gorgeous exterior of Riverside Church. The scale of the church is just amazing, and of course the details are stunning too. After their ceremony at Riverside Church, it was just a short walk over to Dinosaur BBQ’s Harlem location for a laid back brunch with guests. Did someone say ribs, chicken, mac & cheese, and corn bread?! I may be biased since I’m from Texas, but hot damn that is a great choice! As soon as we walked in the smell of smoked meats and good times hit us in the face. Using a few Fuji Instax Mini cameras and some photo corners is a great way to make a fun guest book. I’m a huge fan of the Instax stuff for personal photos, so this always tickles me when I see it at weddings. Who doesn’t love an instant photo?! I love capturing both sides of the speeches, the actions and reactions. You know a speech is really great when you see both sides of the equation! The old wood details inside Dinosaur BBQ were just perfect to place their rings on for a quick detail photo. The celebration continued later with a wedding dance party at Tir Na Nog near Times Square, a solid Irish pub that lended a heavy hand into the theme of the evening – Lord of the Rings! How amazing is that LotR wedding cake? Not to mention the rainbow cupcakes that rounded out the dessert options! The dance moves were strong with Sara & Deanna’s crowd of guests, and the party kept going well into the night. Sara and Deanna, thank you so much for having me along to document your crazy fun wedding story! 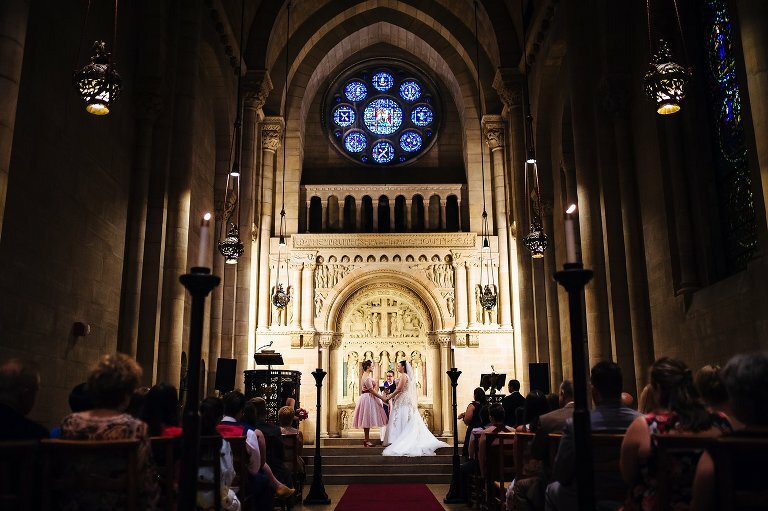 Are you planning a Riverside Church wedding? I’d love to learn more about what you’re planning and how I can help preserve your wedding story in beautiful photos.